Apple has filed trademark applications for Beats 2, Beats 3, Beats 4, and Beats 5. That would be four more stations—does anybody out there even listen to Beats 1? First reported by Consomac, the name and logo trademark applications are all identical. 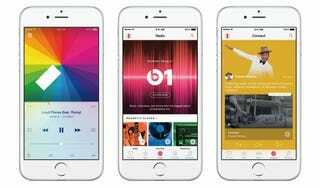 The applications have the broadcasting and transmission of “voice, data, images, music, audio, video, multimedia, television, and radio by means of telecommunications networks” listed under “goods and services.” Which are also the same as the existing trademark on Beats 1, the station that’s already operating. At the same time, Apple’s new deal with record labels allows it to add stations without negotiating a new contract. The thing about trademark is that it’s a “use or lose it” right. Apple’s going to have to actually get these stations up and running if it wants to keep the trademarks, which would seem to lend credence to the fact that the company plans on actually delivering. A 24-hour terrestrial-style radio station seems an odd play for Apple, and I honestly don’t know how many people actually use the product. Are four more stations really what people are clamoring for? The names and descriptions on the trademark applications, all filed on November 13, 2015, don’t give the new stations anything like a specific identity, but lets hope if they launch, “actually good” is something you could say to describe them.